Blend frozen rose with lemon juice and simple syrup until just smooth. Pour into glasses and top each with a splash of Campari and a lemon twist. Summer of frosé! Kelsey has made progress on her capsule skin care and makeup routine and especially loves Paula's Choice Shine Stopper. Kelsey is also recommending hiring a sleep coach, it's been a huge help to her family. Erica is continuing to work toward her goal of more inner peace as the adoption process drags on. 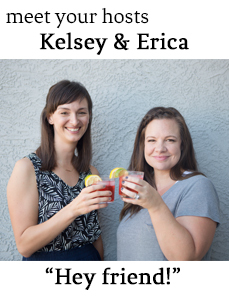 In current obsessions, Erica loves Pioneer Quest on Amazon Prime and Kelsey's getting through the hot summer with afternoon break at work with green tea-lemonade on ice. Erica's wearing her summer scent Pretty as a Peach from Bath and Body Works and smells peachy clean.